Formation Records presents: Critical Impact & DJ SS - Roller Revenge EP Critical impact & Dj SS - Roller Revenge tracklist: 1. Critical impact & Dj SS - Switch plate 2. Critical impact & Dj SS - Bass over 3. Critical impact & Dj SS feat. MC Biggie - This is For The streets 4. 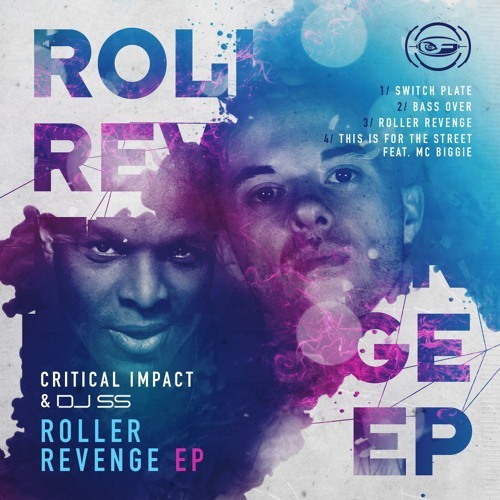 Critical impact & Dj SS - Roller Revenge === OUT NOW AT > Beatport: https://www.beatport.com/release/roller-revenge-ep/1866331 > iTunes: https://itunes.apple.com/us/album/roller-revenge-ep/id1161710640 > Juno Download: http://www.junodownload.com/products/critical-impact-dj-ss-roller-revenge-ep/3232165-02/ > Spotify: https://open.spotify.com/album/1rOaW4dwTGM5JuBUuPvjY0 > Formation Records store: https://formationrecords.databeats.com/download/form12192d === artists links: https://www.facebook.com/DjssFanPage/ http://formationrecordsuk.com/artists/critical-impact/ https://www.facebook.com/mcbiggie/ label links: www.formationrecordsuk.com www.facebook.com/FormationRecs/ www.facebook.com/wodnb === With a month-on-month slew of releases from some of the genre’s most exciting new talent throughout the year, 2016 will go down as a certified vintage for SS’s Formation Records. 27 years deep into its legacy – and responsible for early breakthrough releases from the premiership players such as John B, Hazard, Nero, The Prototypes and many more – the label refuses to let up pace. If anything they’ve upped the game even more this year. Case in point: this all-style four-track homage to timeless drum & bass music from the bossman himself and Bristol’s Clear Skyz affiliate Critical Impact. Having collaborated previously on Formation’s 2014 album ‘Back To The Jungle’ with ‘Undercover’, it’s clear the two artists complement each other with a shared no-rule / no formula vision of drum & bass jungle. Finally the two artists collide once again with incredible, unclassifiable results. We ignite with ‘Switch plate’ a barnstormer of a tune where the iced out pads on the intro give nothing away before a bassline shreds up the game with an electric feel that rewinds us right back to the late 90s… Trust us; this one pretty much demands reloads. ‘Bassover’ switches the feels with a much jazzier dynamic. Thick Bristol vapour trails run throughout as the swinging beats roll with constant changes, a soft-focus vocal yearns over star-gazing elements and the sub pings back and forth with elasticity. Next stop: “Rollers Revenge”, a stark step-chiselled jam that’s dense in 97-era tech layers. Detailed effects and a crisp sci-fi sheen wrap around the lean drum arrangement as pacey, paranoid atmospheres swap and drop throughout the mix. Heads-down business, through and through. Finally, we hit “This Is For The Streets”. The perfect closer to this full-strength, full-flavoured, full-powered body of work, here we’re hit by a brilliant fusion of triplet-swung beats and raw dark funk. The droning rolling subs and techy funk bass plucks are countered perfectly by a great string texture and MC Biggie’s short-but-succinct vocal sample, creating a groove that really does resonate with all corners of the dance. Four underground gems from two highly respected artists: We know you already know this, but this really is proof that drum & bass is best when it’s not served in constricting subgenre boundaries. A rule that’s been key to Formation’s momentum since it began contributing to the unstoppable legacy and influence of drum & bass back from day one. Wicked EP, creepin up on me :) Big Ups!